Well, the MMBT is not just a wordy name. It is laden with rich Civil War history that we don't really think about on a day-to-day basis; it was the Battle of Hampton Roads. Lauren of Swooned and I are a bit of history and art nerds. I've been a huge fan of her mood boards that she creates for her blog for a long time-- each one truly invoking a lovely mood to inspire weddings and beauty no matter the theme. So I was rather ecstatic when she excitedly affirmed that she'd love to make one using the more industrial side of Hampton Roads. Without further ado, I'll let Lauren take it from here! We were over-the-moon excited when we learned that Chelsea, a frequent wedding photography contributor to Swooned, would be embarking on a new venture with the creation of a regional wedding blog. To celebrate the docking of Tidewater and Tulle, we created a special mood board that pays homage to Hampton Roads’ seafaring past. We've always been intrigued by the romance of long-ago shipwrecks, and there is one in particular that has ties to the area—that of the USS Monitor, the first ironclad commissioned by the U.S. Navy during the Civil War. She is most famous for going up against the USS Virginia, a Confederate Navy warship made from the remnants of the USS Merrimack, in the Battle of Hampton Roads on March 9, 1862. The battle marked the end of the age of sail in Hampton Roads and the beginning of the age of iron and steam. This transition is symbolized in our board through the mixing of natural, organic elements with metallic details that have an industrial feel. The moody oceanic palette was inspired by the colors in one of semi-abstract artist Paul Bennett’s oil paintings, Fallen 2. The storm-tossed sea that he depicts was probably not unlike the one that caused the USS Monitor to founder off Cape Hatteras on December 31, 1862. One of our favorite details is Yasushi Jona’s corroded ring, designed to appear as if it were recovered from the ocean floor. We tried to evoke a sense of the beauty of what remains. 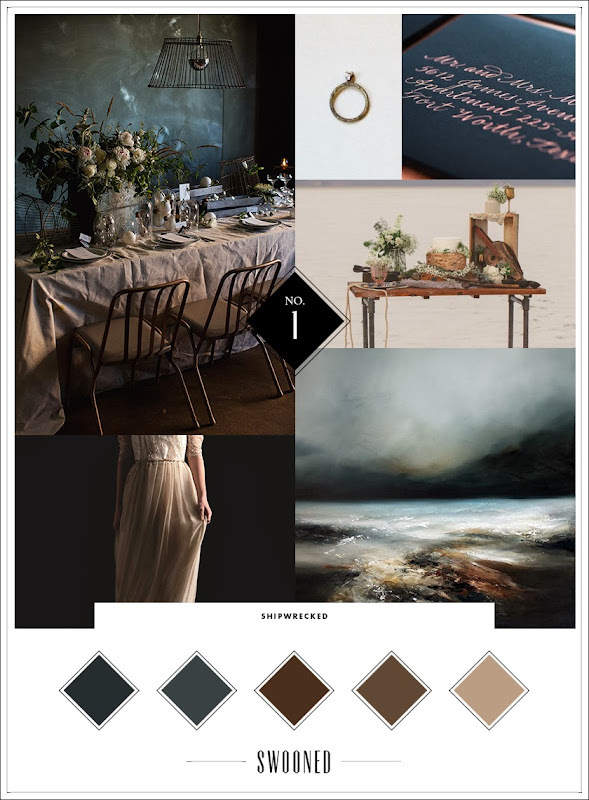 I'm completely obsessed with this mood board as it takes on the Atlantic Ocean in more somber, yet ethereal tones and adding a richer layer to a typically nautical/beachy theme. Oh so perfect for winter! You can find more of Lauren's gorgeous mood boards on Swooned's website, Facebook, and Twitter. But the inspiration doesn't stop there, her Pinterest is crazy wonderful, too!